The event was dedicated to the forthcoming BRICS Summit in Goa. An audience in Delhi was enchanted with a performance by the famous Russian Youth Dance Studio “Orchid” from Rostov-on-Don at the Russian Centre of Science and Culture Monday. 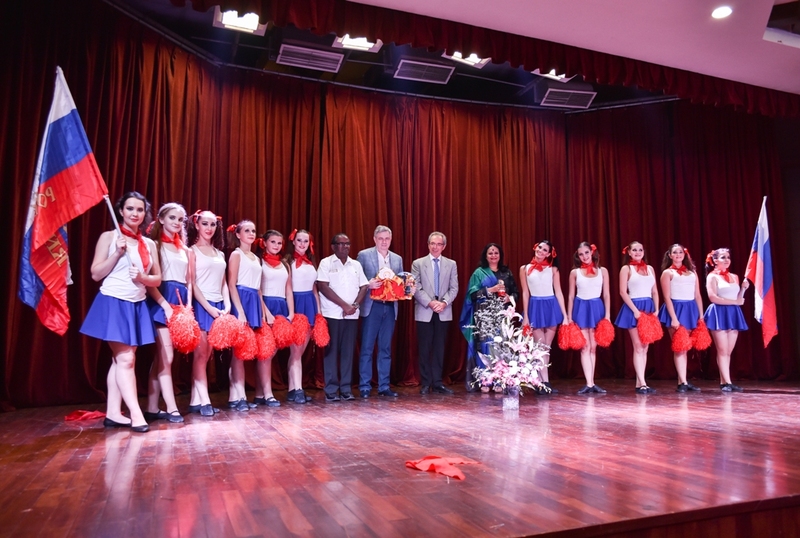 A spectacular concert by the famous Russian Youth Dance Studio “Orchid” from the City of Rostov on Don, enthralled the audience at the Russian Centre of Science and Culture (RCSC), New Delhi, on September 26. Organised in collaboration with the Indo-Russian Chamber of Commerce and Industries (Tamilnadu), the event was dedicated to the forthcoming BRICS Summit in Goa (October 15-16, 2016). The visiting artists, dressed in magnificent costumes, drew thunderous applause during their wonderful performance. Acting as the Master of ceremonies, P. Thankappan General Secretary, Indo-Russian Chamber of Commerce and Industries (Tamilnadu), introduced the artists. Dignitaries who participated in the function included Chief Guest Pratibha Prahlad, Director, Delhi International Arts Festival, Major Dalbir Singh, Secretary, AICC, Sergei Karmalito, Senior Counsellor in the Russian Embassy and Fedor Rozovskiy, Director, RCSC, among others. The audience comprised members of the diplomatic corps, Russian compatriots, social activists, artists, educationists, academics, Russian language students and media persons. The artistes presented remarkable dance items including the Belly dance, Cossack dance, Fairy Tale, Variation Nicky, Kalinka, Nutcracker, Kukushka, The Dying Swan, Dilemma, The Night, Through the Looking Glass, Brazilian Carnival, and Russia. Throughout the performance, the music of Tchaikovsky resounded in the background, creating a magnificent ambience. After the performance, the artists were felicitated by Ms. Prahlad, Counsellor Karmalito and Director Rozovskiy. Orchid also gave a performance at the Manav Rachna International University, Faridabad, on September 24. They will also hold concerts at the RCSC in Chennai, as also in Coimbatore, Madurai, Bangalore and Hyderabad in the following weeks. The Russian Dance Studio “Orchid” was set up in September 1999 in the city of Rostov on Don. The group has taken part in many Russian and international dance festivals and competitions. Their repertoire comprises classic Russian folk dances, famous ballet compositions as well as contemporary dance styles like jazz, modern dance, and so on.